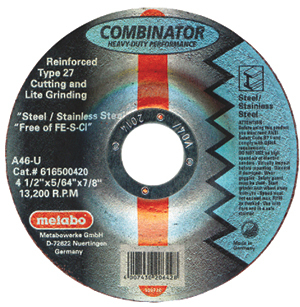 Metabo, West Chester, PA, introduces the Combinator, a combined cutting and grinding wheel designed for performance and safety that eliminates the need to change abrasive wheels. Fabricators will use the Combinator for cutting, deburring and light grinding. At 5⁄64 in. thick, it cuts quickly. And with three full layers of fiberglass, safety is designed into the wheel for grinding. Available in 4.5-, 5- and 6-in. Type 27 versions, the wheel employs an improved abrasive/resin formulation for fast cutting with increased wheel life, as well as strength and rigidity for grinding and metal removal.